Tazbell Services Group announced as one of Ireland’s Best Managed Companies! 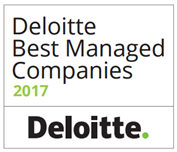 The Deloitte Best Managed Companies Awards Programme, in association with Barclays Bank Ireland, recognises indigenous Irish companies across Ireland which are operating at the highest levels of business performance. The network of 127 Best Managed Companies now employs over 60,000 people around the country and has a combined turnover of almost €11bn. Recognising theimportance of overseas markets for Irish companies, the Best Managed Companies also recorded an average growth in sales of 44% over the last threeyears. Sixteen companies from around Ireland were awarded “Best Managed” status for the first time this year, following a detailed qualification and judging process. This took into consideration the complete performance of the business, looking beyond the finances at criteria such as operational excellence, strategy and human resource processes. Seventeen companies were presented with a “gold standard” accolade having secured “Best Managed” status for four consecutive years. Eleven companies were also presented with a “platinum club” accolade having secured “Best Managed” status for seven consecutive years. An additional 83 companies re-qualified having upheld the standard of a Deloitte Best Managed Company, following a comprehensive review process. Tazbell is a leading Irish services group serving both the public and private sectors.Established as an asset management company, Tazbell has grown and diversified.We provide a range of outsourced management service across areas of collections, transportation, parking, toll operations, enforcement services, traffic management, fine collection, remote management, contact centre, bespoke technology and reporting functions.Tazbell is headquartered in Dublin, and employs almost 300 staff in its businesses across 30 locations.